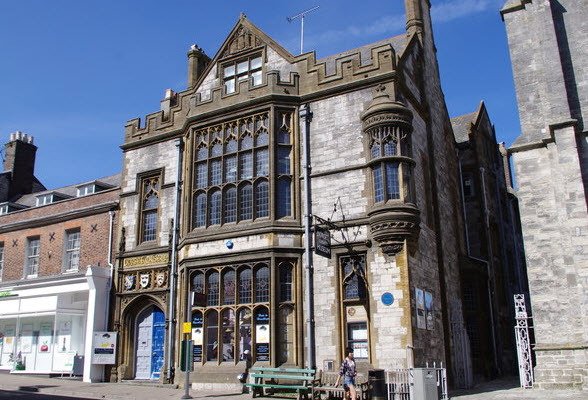 The Dorset County Museum is located in Dorchester, Dorset, England. Founded in 1846, the museum covers the county of Dorset's history and environment. The current building was built in 1881 on the former site of the George Inn. The building was designed specifically to house the museum's collection and is in the Gothic style. The museum includes information and over 2 million artifacts associated with archaeology (e.g., Maiden Castle), geology (e.g., the Jurassic Coast), history, local writers (e.g. Thomas Hardy) and natural science. There are video displays, activity carts for children, and an audio guide. The collections include fossilised dinosaur footprints, Roman mosaics and original Thomas Hardy manuscripts. Go and visit Dorset Museum and then come and pop into Taste Brasserie for lunch or afternoon tea. Or why not start the day off with a Taste Brasserie breakfast and then go explore Dorset Museum.